U.S.-backed Kurdish militia members are preparing for a fight against Turkish forces to hold on to Syria’s Manbij region, an area where U.S. forces are also known to operate. “Coalition forces near Manbij have received fire from suspected Turkish Supported Opposition groups sporadically over the time we have been patrolling there,” Col. Ryan Dillon, a spokesman for Operation Inherent Resolve, told Military Times. After crossing the border to attack a Kurdish enclave in Afrin, Syria, the Turkish military has started refocusing roughly 60 miles east, towards Manbij, Turkish President Recep Tayyip Erdogan announced Wednesday. “We are concerned about the situation in northwest Syria, and the potential effect that these operations could have on operations to defeat Daesh in eastern Syria. We call on all parties to remain focused on defeating Daesh in Iraq and Syria, de-escalating and resolving the Syrian conflict and protecting innocent civilians,” Dillon said. Operation Inherent Resolve officials stated that Kurdish militia in Afrin have not been receiving training, support or advisers from the coalition. When U.S. forces come into contact with the Turkish military they “do have procedures to de-escalate the situation,“ Dillon confirmed. However, he noted that he could not discuss the rules of engagement they are operating under. Dillon added that he wouldn’t speculate on Turkey’s possible actions. Additionally, he said that he wouldn’t speak to what Russian units, also known to be operating in the area, are planning to do. “We continue to deconflict air and ground operations with Russians, daily, to ensure we can continue to safely support our partner force [as they] pursue remaining ISIS elements in Syria, namely along the eastern side of the Euphrates River,” Dillon added. However, Dillon said they also remain committed to continuing their partnership with the Syrian Democratic Forces, the U.S.-backed alliance of Kurdish and Arab fighters. “At a significant cost, the Syrian Democratic Forces continue to rid the world of Daesh, who used locations like Raqqa, Tabqa, and Manbij to plot, resource, recruit, direct, inspire, and launch attacks around the world,” he said. By stabilizing liberated territory and returning displaced refugees, members of the coalition hope ISIS will be prevented from returning as an insurgency, as some researchers have forecast. On Wednesday, President Donald Trump spoke by phone with Erdogan, according to a White House press statement. During the call, Trump relayed his concern that escalating tensions in Syria would undercut coalition interests in the country. However, Turkish officials have disputed the White House’s reading of the conversation, adding that it does not “accurately reflect” the content of the discussions. 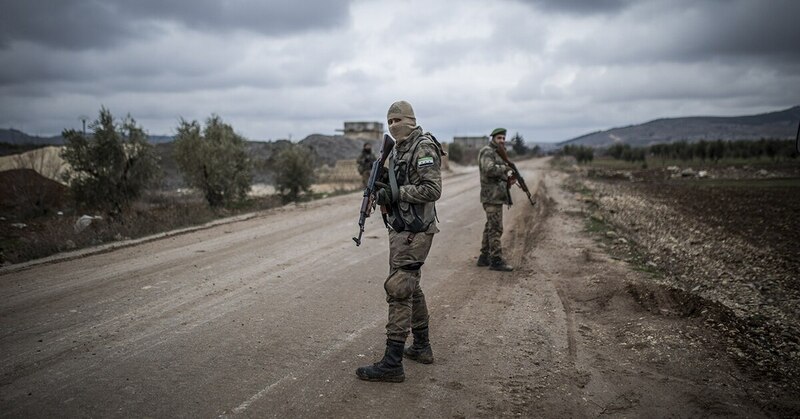 Turkey has long held security concerns over U.S. provisions being given to Kurdish militias, which Turkey associates with the Kurdistan Workers’ Party, or PKK. Although the PKK is labeled a terror group by both countries, the U.S. government does not consider the Kurdish presence in northern Syria to be part of the group. The People's Protection Unit, which makes up a large portion of the SDF, is thought by Turkey to be indistinguishable from PKK elements.